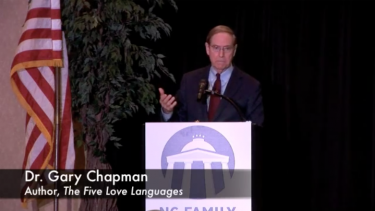 On Monday, March 9, 2015, the NC Family Policy Council hosted our annual Major Speakers Dinner in Greenville, N.C. with Dr. Gary Chapman as our featured speaker. Dr. Chapman is the author of New York Times best-selling book series, The Five Love Languages, and his keen and practical insights have been credited with saving marriages and improving relationships worldwide. At the dinner, he spoke about the seven traits that characterize true, authentic love and how we can live out those traits in our daily lives.